Putzmeister America Inc. recently re-organized its parts department to allow room for more parts storage on-site. The expansion includes the investment of three highly advanced storage and retrieval systems, adding to the two systems purchased in 2005. 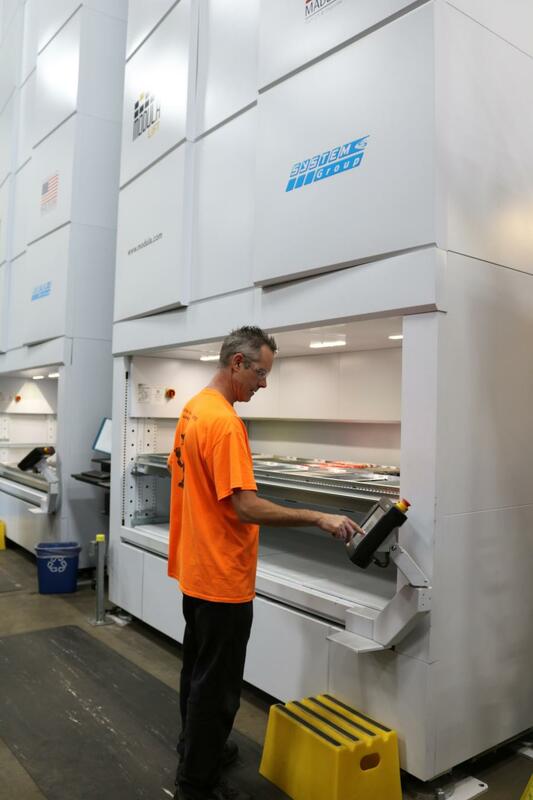 The addition of the storage and retrieval systems allows for Putzmeister to keep all parts in-house, eliminating off-site warehouses. Each system houses thousands of small to medium sized genuine Putzmeister parts in a vertical structure, which extends from floor to ceiling. Each 26-ft. tall, 8-ft. wide and 9-ft. deep structure saves up to 70 percent in square footage space by fitting more parts in a smaller area. "Now that we have five complete storage systems, Putzmeister is even closer to your business," said Eric Zimmermann, director of parts sales and pipe technology of Putzmeister. "We continue to push the bar and find every way to make our process even more efficient to best serve our customers." The system works by entering a "pan" number on a keyboard, indicating the x and y coordinates of the parts location inside. The computer uses this data to retrieve the part electronically within seconds. The greater efficiency in filling parts orders translates into faster shipments to customers while reducing the chance of erroneously picking the wrong part for shipment. The system also tracks fast and slow moving pans to position them strategically within the structure for even quicker processing. Within each structure, 73 pans (sized 81 in. wide, 32 in. deep and with varying heights) are divided into adjustable sections to separately house items from small fuses to large motors. Each pan can accommodate 900 lbs., with the entire structure capable of handling a total weight of 40,000 lbs. "Having immediate access to thousands of additional parts is a time saving advantage for our customers," said Zimmermann. "Presently, the average time to electronically retrieve a part with the Lean Lift system is under 30 seconds. In comparison, the average time to previously retrieve a part via traditional methods was triple that time." Putzmeister's Lean Lift capacity has doubled to continue to reach the customer's needs quicker, with accuracy and efficiency. Putzmeister's genuine parts can be ordered online from Putzmeister's Webshop at shop.putzmeister.com or by calling the Toll Free Parts & Service Hotline at 800/890-0269.